March last year, excITE, our youth centre, embarked on a collaboration with ITE College East for a service learning project, sponsored by Chip Eng Seng Pte Ltd, a construction company. 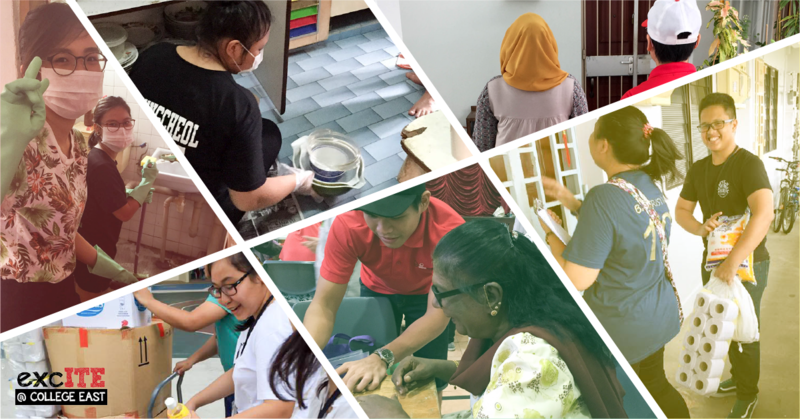 After the completion of 24 hours of service learning within a year, the 22 student participants chosen by ITE were each awarded the Chip Eng Seng Study Grant. During the course of the project, the students served the needy elderly in the community and learned to step out of their comfort zone to overcome language barriers and more. The following are some of their testimonials and reflections. Following the initial project briefing held in March 2016, the students conducted two rounds of Fengshan CC surveys on the 23rd and 30th April 2016. “First activity was door-to-door (giving out) food ration and survey to the residents in need of help. It was my first time seeing people living in homes with such a small space. I felt satisfied offering my assistance and was determined to help each household. On the 27th August, the students were dispatched to 4 different elderly homes to help conduct Spring Cleaning. These 4 homes were selected due to the limited mobility of the elderly. “CES (study grant) have helped me in many ways, the most obvious ones are helping me get back on my feet with the allowance given to support my study in school monthly. The project has also opened my eyes to lend a helping hand to the less fortunate that we hardly see in the street. Other than helping with the Fengshan CC survey and spring cleaning project, the students helped to give out vouchers at an Elderly Luncheon on 17th September and also ran a fund-raising stall in their own school on the 13th and 14th July before the spring cleaning project. Some of them helped to distribute lunch packets with our Elderly Services Meals-on-Wheels staff as well. Group photo on 12th January 2017. Closing ceremony for Chip Eng Seng Project 2016. Based in ITE College East in Simei, excITE @ College East is a youth centre co-sponsored by BCS and ITE College East. Through daily activities, interest groups and programmes, excITE helps students build resilient habits and healthy values during their years in school and working life.